Got pesky competitors cluttering up your best keywords? Well, have I got the tool for you! 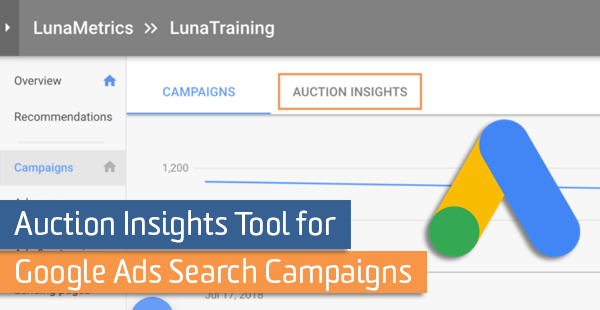 The Auction Insights tool allows you to see all the other domains entering the same Google ad auctions at the campaign, ad group, and keyword level. Additionally, they give you information on how well your ads are performing in comparison to the different advertisers’ domains. Before we get into the nitty-gritty about metrics and insights this tool provides, let’s find out where you can access it within the Google Ads interface. First, select the account level in which you want to do your investigation. Campaign and ad groups will provide broader insights, while keywords can really focus in on specific ad auctions, especially on exact match keywords. To use the Auction Insight tool at the campaign and ad group level, simply click on the Campaigns or Ad groups tabs on the left navigation bar. Next you will see a tab at the top of the page, right under the account breadcrumbs, called Auction Insights. For keywords, it’s a little trickier to find. Again, the first step is to click on the Keywords tab in the left navigation bar. Now you will need to check the keywords that you want to get insights on specifically. Note: if you choose a keyword or keywords with too little activity, Google will not be able to generate a report. If this happens simply change the date range or expand the keywords that you are looking at. You might be asking yourself, “Why wouldn’t you always have 100% here if you were eligible for an impression?”. Well, one unfortunate truth is that we don’t always have enough budget to get us through the day. Google estimates this number of impressions based on your ads targeting settings, approval statuses, bids, and Quality Scores while assuming you had unlimited budget. So if we had an Impression Share of 40%, this would mean our ad only showed up 40% of the time that we could have shown. Keep in mind, your competitors’ Impression Share will be dependent on their own targeting criteria, statuses, bids and Quality Scores, so these numbers will be hard to compare against each other. The “Average Position” metric is exactly what it sounds like. It tells you the average ranking position for your ad (or competitor’s ad). If you have an average Avg. Position of 1.2, this means that most of the time your ad is showing up above all other advertisers, but on occasion somewhere below. This is a great metric to compare how you are ranking compared to your competitors. The closer your number is to 1 the higher the ad is ranking. it does not tell you the position of the ad on the page, only the rank compared to other advertisers. For example, an ad with an Avg. Position of 2 might be the second ad on the page, but it may be appearing at the bottom of the page. “Overlap Rate” is how often another advertiser’s ad received an impression in the same auction that your ad also received an impression. If another advertiser has an Overlap Rate of 20%, this means the competitor appeared in the same search results a fifth of the time our ad appeared. The higher the Overlap Rate the more likely you have similar targeting, Ad Rank, and budgets to the other advertiser. If their Overlap Rate is low, it could be due to a very small overlap in targeting or that they have a smaller budget or low Quality Scores. “Position Above Rate” is how often another advertiser’s ad in the same auction shows in a higher position than your own, and only when both of your ads were shown at the same time. So let’s do some quick math to see how we can further use this metric for insights. If a competitor had a Position Above Rate of 50% and your Overlap Rate was 20%, that would mean that roughly 10% of the time our search ad was in the auction this other advertiser appeared above our ad. “Top of Page Rate” tells you how often your ad or other advertiser’s ad (depending on the row) was shown at the top of the page in the search results page. This is the metric to determine how often your ad is at the top of the page, and not Average Position. When viewing a competitor’s Top of Page Rate keep in mind that this metric is independent of when your ad is shown. So if for example, both you and your competitor had a Top of Page Rate of ~90%, you are likely not getting ad impressions at the same time. To get deeper insights, compare it to the Overlap Rate. The “Outranking Share” is a percentage that represents the number of times your ad either ranked higher in the search auction than a competitor’s ad or appeared when the competitor did not, divided by the total number of ad auctions you took part in. This metric will give you the best insight into how you are competing head-to-head with another competitor. If another advertiser is your sworn enemy, you want this metric as close to 100% as possible to make sure your ad appears first and is visible whenever possible, especially if you have a high Overlap Rate with that competitor. Now that you’ve used the tool, you might have noticed that you have a displeasing domain that keeps taking that top search ad placement that is rightfully yours! What can you do about it? There is an automated portfolio bid strategy called Target Outranking Share that lets you target another domain to help you outrank them. It works by automatically raising and lowering your CPC bids to outrank the competitor’s ads. All you need to do is select a domain and give a target percentage to outrank your competition by (up to 100%). You can also set a maximum bid limit to help you keep your cost-per-clicks to a reasonable level. This is extremely important to do with the “Automatic” bid automation turned on! Additionally, you can choose whether or not you will use this bidding strategy on low Quality Score keywords. Just keep in mind if you do, these keywords will likely have a high CPC to compensate for their low Quality Scores. This bid strategy may take a day or two for bids to be updated, because the data used for this bidding strategy is only updated once a day. Google also recommends to not change the bid strategy settings for 7 days, as it can take that long to start producing results. If you do start targeting another domain to outrank, just be prepared for a bidding war! And may the best advertiser, win!